Restate and Explain in their OWN words. 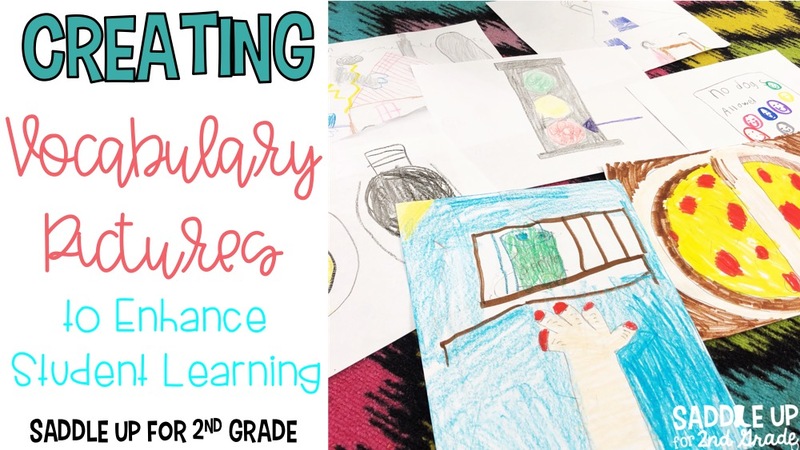 In my previous post, I shared 3 Vocabulary Activities to Introduce and Explore New Words. Today I’ll be focusing on creating a visual with drawings. Each week we create these vocabulary pictures to go along with our words. 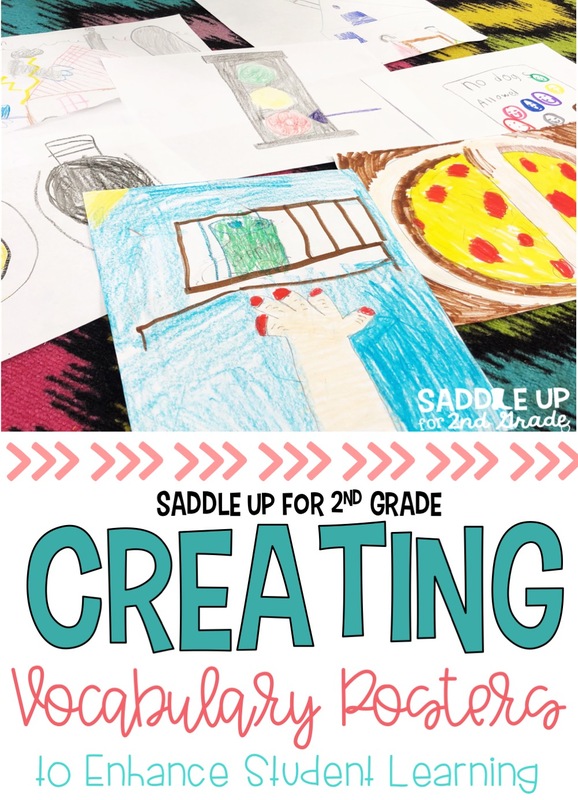 Put your students into groups of 3-4. Your groups can be more or less depending on the number of words you are working with. I introduce eight new words a week. I would create 2 posters myself and then divide the other six words between six groups. Assign each group a vocabulary word. They aren’t allowed to share what word they have with the other groups. 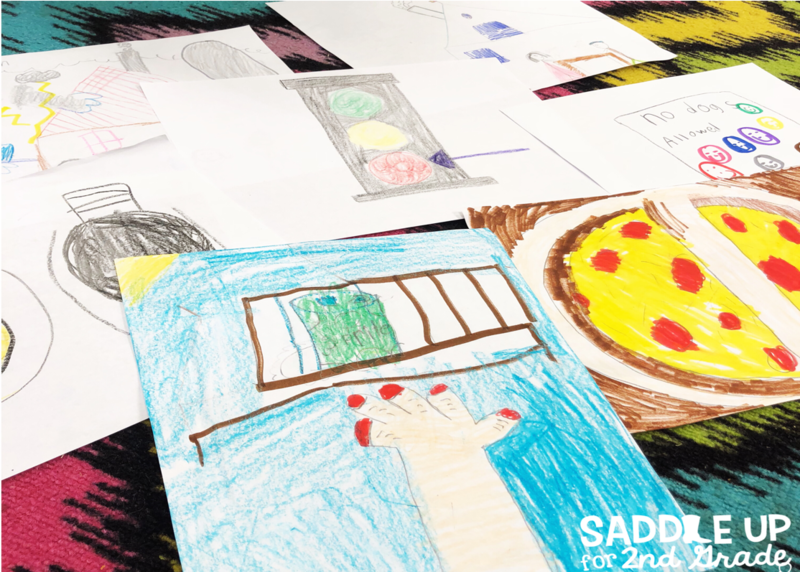 Each group will also need a piece of paper (I like to use the large Manila paper but copy paper works great too) and a set of crayons or markers. Each group must come up with an illustration that represents their vocabulary word. I normally allow 10 minutes for this. Once all illustrations are complete, each group stands and holds up their vocabulary picture. They are to describe their illustration but they cannot say what word they are representing. The students from other groups will then try to guess which vocabulary word is being represented. I then will display each poster for us to refer back to throughout the week. The first example of this is an illustration of the word impossible. 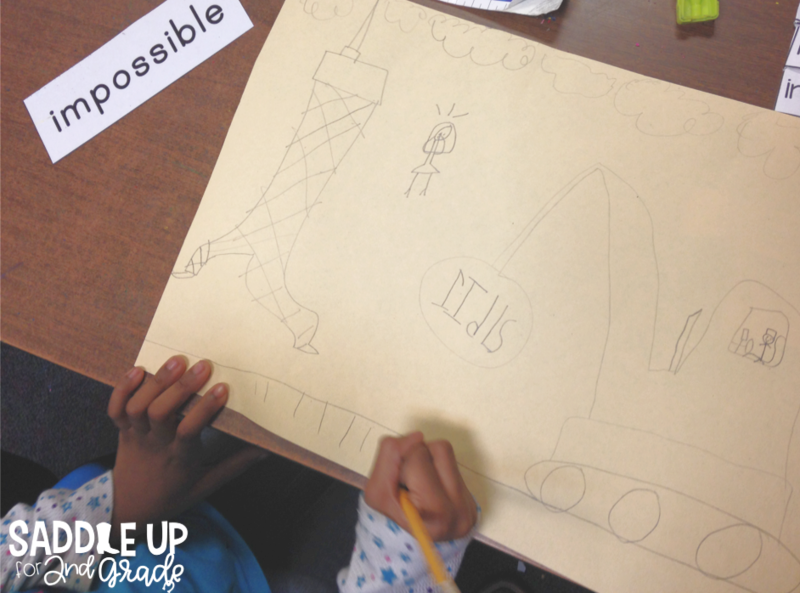 They drew a picture of a wrecking ball knocking down the Eiffel Tower. This isn’t something that would normally happen but to a second grader, this was something that seemed impossible to them. It was something that THEY could relate too. 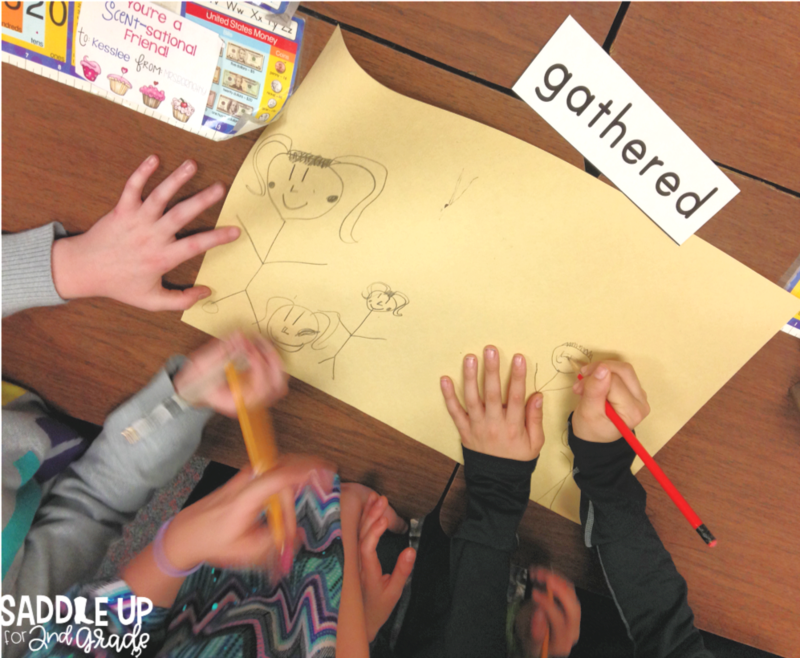 Here, my students drew a picture to represent the word “gather”. The children in the illustration are “gathering” apples. I sometimes like to take these one step further and allow each group to create a motion to go along with their word. Here they made a motion like you were picking an apple off of a tree and placing them into a basket. Throughout the week I will say “show me the motion for _____”. It’s a fun and quick way to review and again it allows them to make that personal connection. A few other examples are shown below! -The hand is reaching for a can of soda on the table. -The pizza is divided into equal halves. They connected this one with math and it made me so happy! -The no dogs allowed sign illustrates beware. Want to see a closer look and explanation of the above photos? Watch this quick video I shared on Instagram. This simple vocabulary strategy can be implemented into your day in just 20 minutes. We spend 10 minutes creating our vocabulary pictures and another 10 minutes sharing their illustrations. This lesson has become one of my favorite parts of our week! Like this post and want to save it for later? Pin the image below!